Chinese environmentalists explain why the incentives that work in favour of pollution, rather than its prevention, will remain, despite new legal powers. Radio Free Asia reports. As China moves toward toughening up the country’s air pollution law to, among other revisions, permit higher fines against polluters, Chinese environmentalists explain why the incentives that work in favour of pollution, rather than its prevention, will remain, despite new legal powers, without a reliable mechanism for enforcing existing laws. Law enforcement, they say, is continuously undermined by rampant corruption at the local government level, where bribes are more persuasive than the incentives to take action against polluting enterprises. This article by Radio Free Asia quotes Yang Yong, a high-profile independent geologist-explorer, and the author of several reports for Probe International. Reported by Gao Shan for Radio Free Asia’s Mandarin Service. Translated and written in English by Luisetta Mudie. This report was published by Radio Free Asia on December 31, 2014. 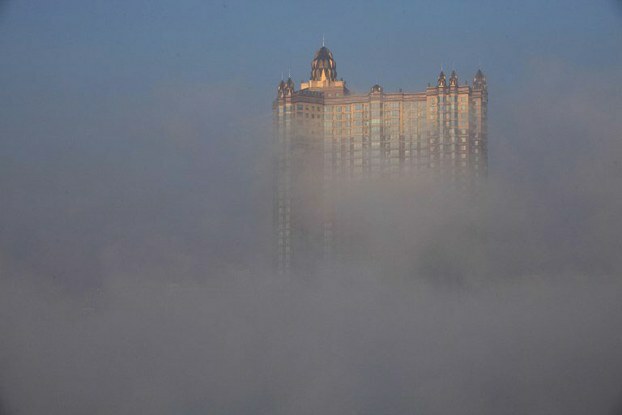 View of a high-rise building in heavy smog in Jilin province, Feb. 12, 2014. ImagineChina. As China’s parliament plans harsher punishments for polluters, environmental activists said higher fines can only do so much to curb the country’s “airpocalypse” in the absence of a strong enforcement regime. In the last few days of 2014, delegates to China’s rubber-stamp parliament, the National People’s Congress (NPC), were considering draft amendments to air pollution control laws which will also set up a monitoring and early-warning system for the brown smog days which periodically blanket northern China, sometimes closing schools and airports. Under the proposed changes, companies found emitting air pollutants without permission or evading supervision by falsifying data will have their production limited or suspended, according to the official Xinhua news agency. Fines for offenders will be boosted to at least 100,000 yuan (U.S. $16,115), although they will be capped at one million yuan (U.S. $161,150), it said. Police will have the power to detain anyone found to be in violation of anti-pollution rules, it said. It would also require local governments to include a response to heavy pollution days in their emergency response plans. The new rules would give local governments the power to shutter polluting enterprises, ban or limit road traffic and suspend demolition projects. Beijing authorities have previously used such measures to produce uncharacteristically blue skies ahead of the 2008 Olympic Games and the Asia Pacific Economic Cooperation (APEC) forum last month. Local authorities could also use artificial weather modification techniques, as well as shutting down outdoor sports activities in schools, Xinhua said. The ruling Chinese Communist Party blames a rapid rise in car ownership and coal-burning for heating systems and power generation for the smog. But environmentalists told RFA that there is no reliable mechanism for enforcing existing laws. Sichuan-based earth scientist Yang Yong said the aim of the amendments is to tighten existing targets and standards for air quality. Wu Lihong, an environmental campaigner from the eastern province of Jiangsu, agreed, adding that rampant official corruption made enforcement very difficult. “So they buy off local officials, and official and commercial interests become intertwined,” he said. Wu said local governments currently have few incentives to take action against polluting enterprises. “The polluting enterprises fake their records, and they conspire with local officials to cover up the extent of the pollution,” he said. “The worst thing about it is, it’s always ordinary people who suffer great harm from pollution,” he said. Around 600 million people are affected by air pollution and smog days that plague northern China, according to a July report from China’s State Development and Reform Commission. And a recent report by the American National Academy of Sciences found that residents of northern China could be losing five years of life expectancy compared with those in the south, which until recently has enjoyed better air quality.